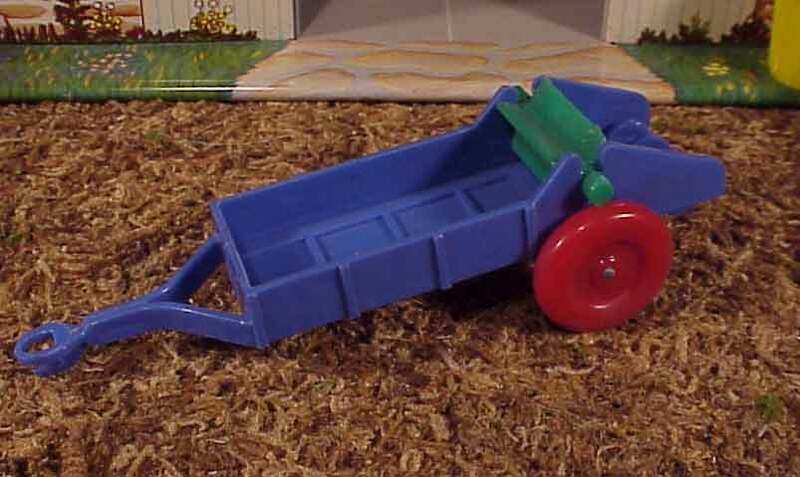 The tractor that comes with this set is very small and made of very fragile hard plastic. Any pressure on the wheels and they break off. 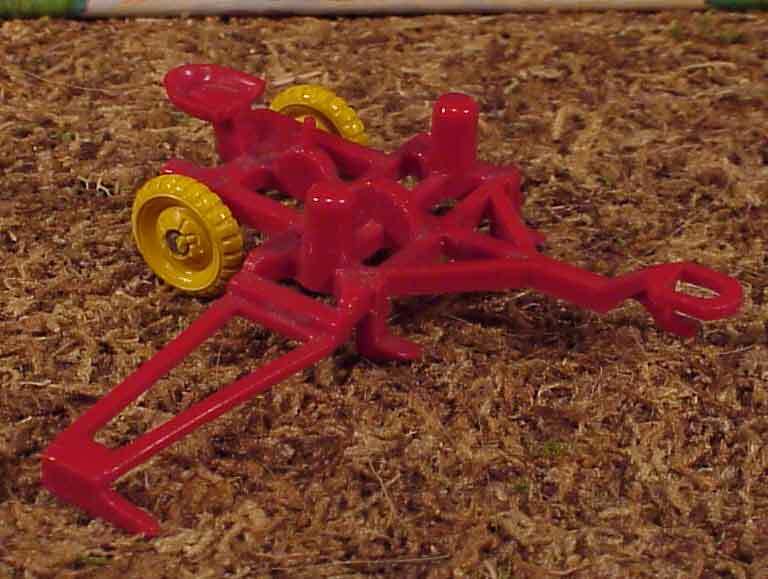 Likewise, all the tractor implements are in the same type of plastic and have the same problems of breakage as the tractor (especially the wheels). While the box only shows the tractor and seven implements, all my sets came with an additional six tractor implements. The implements shown on the box are the plow, the wagon, the snow plow, the scoop, rock sled, the harrow, and the corn row planter. The implements not shown on the box are the mower, the cart, the lime spreader, the manure spreader, the hay rake, and the disk. The tractor shown in the 1951 color page of the Sear's Wishbook is red with yellow wheels. 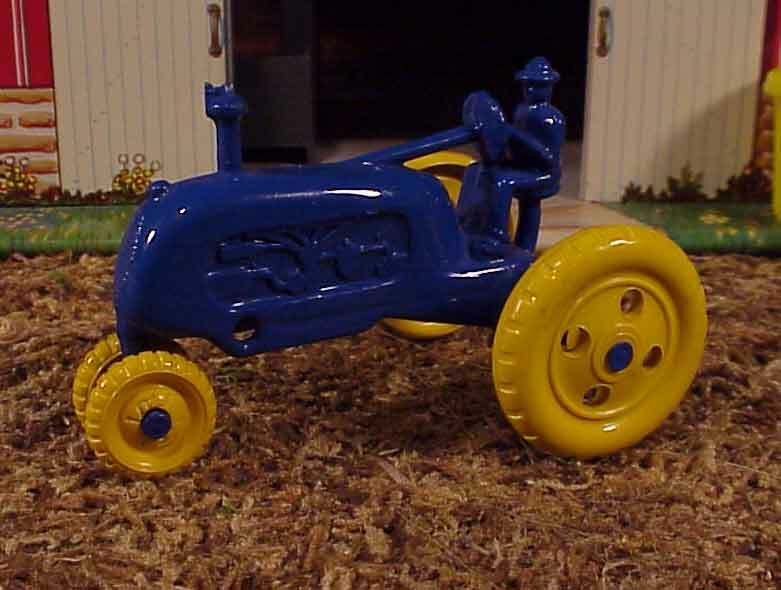 One of my tractors is blue with yellow wheels. I understand that there were several color variations, and I have heard people say that John Deere collectors covet this tractor in the green color. 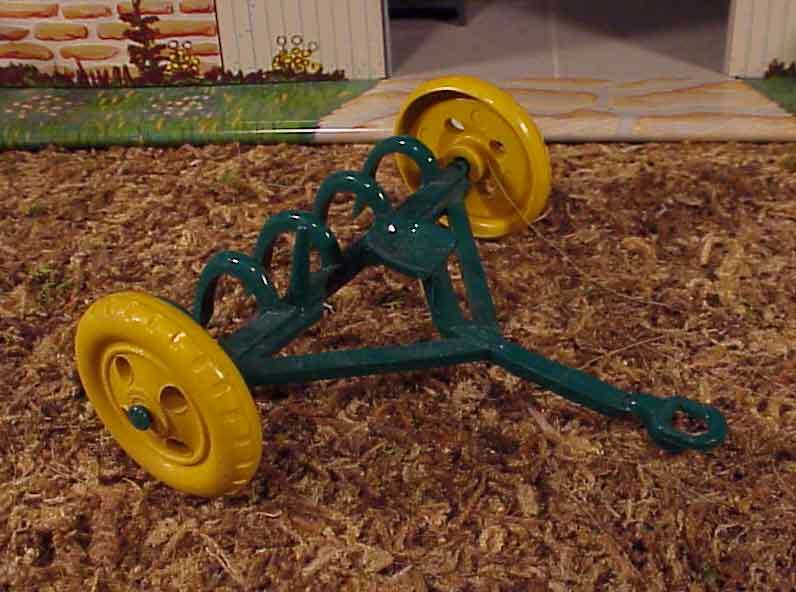 The implements are mostly in red and green with yellow wheels. However, there are some blue and yellow parts. They are attractive and interesting. They are also hard to hook up to the tractor. There are three connectors to use for this purpose, but I can see how this could break easily if not careful. I don't see these easy to break farm toys ever being actually used outside in the dirt. I think they were designed for "rug" farms or table top fields. To see all the implements, please refer to the playset's contents listing at the end of the article. There aren't a lot of animals included in this farm set. They are typical of the early Marx figures in that they are 60mm in size. They are atypical of the early Marx figures in that I think the sculpting is pretty good. The animals in my sets followed the same color patterns. 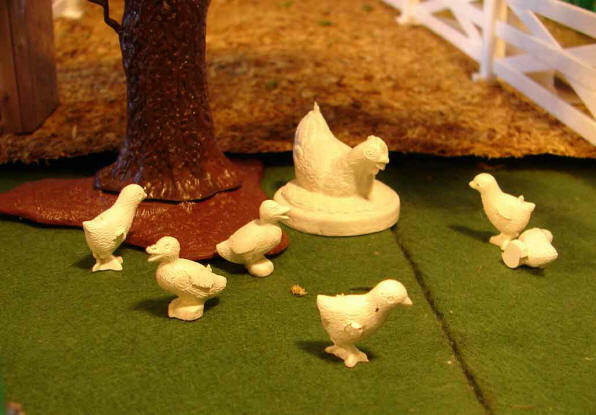 The larger animals (cows and horse) were in gray and brown, the smaller animals were all in a nice cream, and the fowl were in white. One of my sets had a large draft horse. I don't know if this horse was part of the set or not. The childhood owner could have added this. 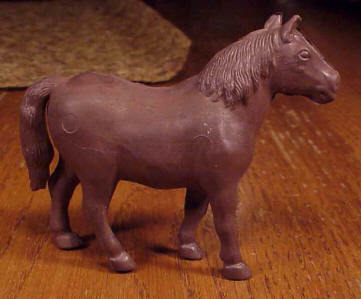 However, upon examining the Marx molds for these animals, this horse was part of the mold that contained the large cows and the standing horse. 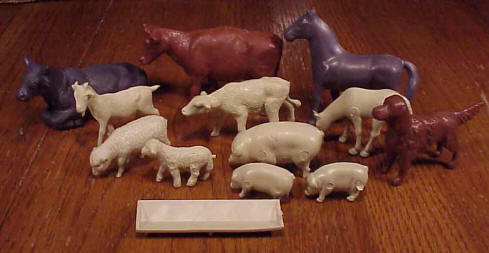 I like that the animal mold for the pigs included a feed trough. 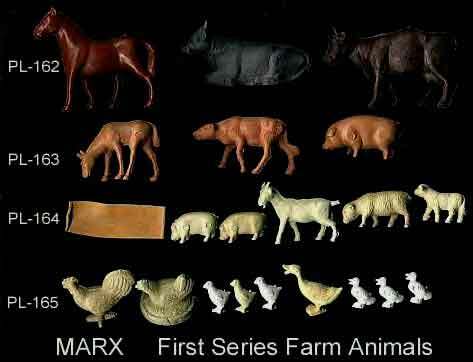 Speaking of Marx molds, Kent Sprecher provided me pictures of the molds that the Marx farm animals came from.